Tea is the second most consumed beverage in the world, second only to water, and for good reason. Teas are tasty, relaxing, healthful, and drinking a cup of tea is a time-honored way of socializing with others. People have been drinking tea for thousands of years. True tea, which means beverages made from the leaves of the tea plant, was first discovered in China, but cultures around the world make their own versions of tea from other plants. For instance, there is rooibos from Africa and yerba mate from South America. As you explore smoothie recipes and healthful ingredients, consider using tea as your liquid base. With teas you can add both interesting flavors and important health benefits. To be officially considered tea, a drink must be made from the leaves of the plant called Camellia sinensis. Any drink called tea that is not made from this plant, is considered to be an herbal tea, also known as tisane. There are two subspecies of the tea plant, one which grows in China, the other in India. These are the traditional tea-growing regions, but tea can be grown anywhere the weather and soil conditions are right. To make tea from Camellia sinensis, the leaves of the plant are processed. Depending on the type of tea being made, the leaves may be dried, oxidized, or fermented. There are six categories of tea based on the amount and type of processing: black, oolong, green, white, yellow, and dark. To make black tea, the leaves are dried and fully oxidized. Oolong comes from partially oxidized leaves, while those for green teas are barely oxidized. White tea is made from the young shoots of the tea plant, which are not allowed to oxidize at all. Yellow teas are rare in the U.S. and are made from leaves that are more oxidized than green tea. Dark teas are also rare and are the only type of tea to undergo fermentation. As a result, they contain probiotics. True tea, from the Camellia plant, is rich in compounds that have been proven through research to have important health benefits. Tea contains many antioxidants and these have been shown to protect against certain types of cancer including breast cancer, colon cancer, lung cancer, liver cancer, and more. The antioxidant compounds in tea help to prevent cancer by attacking free radicals in the body that can damage our DNA. The antioxidants in tea have also been shown to boost your body’s ability to extract energy from fat. This means that tea can help you maintain a healthy weight and increase your athletic endurance by allowing your body to harness more energy. This is more true for green tea than the other types. Tea has also been linked with prevention of cardiovascular disease, a lower risk for developing Parkinson’s disease, protection from ultraviolet rays from the sun, and with increased bone density. Tea may even help people with diabetes process sugar more effectively. All of these benefits are important, but keep in mind that they are for true teas, not herbals. Various herbal teas have their own benefits associated with drinking them. Among the different types of true teas, green tea has been most widely studied. Dark tea, although not studied often, is known to contain probiotics, which can aid in digestion. There are many different types of herbal teas, each with its own particular health benefits. Below are some of my favorite herbal teas, many of which I consume regularly and use in my smoothies and elixirs. Some are even marketed as treatments for certain medical conditions and should be used with the same care as supplements. As with any new food or supplement you introduce into your diet, start small and work your way up. Pau d’arco. Pau d’arco is a tree native to South and Central America. The inner bark can be used to make a tea. The Pau d’arco tree was used by ancient people in the rain forest as an overall tonic for good health and to cure certain diseases. It is still used today as a folk remedy for a number of conditions. A potent anti-fungal, it is often consumed by those with fungal conditions such as candida. Research has investigated some of the active compounds in Pau d’arco and found that it acts against cancer cells and malaria by stimulating the immune system. Reishi. Reishi is a type of fungus that is typically consumed as a tea, rather than eaten like culinary mushrooms. Reishi can help to boost your immune system and has anti-cancer properties. It can also lower blood pressure and help maintain normal blood sugar levels. Reishi has a long history of use in Chinese medicine. Chaga. Chaga is also a mushroom that can be made into a potent tea. It is not very common in the west, but has been used for many years in Russia and Eastern Europe. Chaga tea can help reduce inflammation, lower cholesterol, and reduce blood sugar levels. It also boosts the immune system and help fight cancer. Chaga tea has become a favorite of mine. Chaga is often considered the king of mushrooms and reishi the queen. A tea made from both of these mushrooms is quite divine and what I typically use in my elixirs. Rooibos. This beautiful red tea comes from a plant that is native to South Africa. It is naturally decaffeinated, yet has a strong flavor that is comparable to coffee and black tea. Rooibos not only tastes good, it is also packed with antioxidants and may help protect against cancer. Rooibos is also thought to relieve tension, allergies, and indigestion. Yerba mate. This tea, which is made from a South American plant, is a powerful stimulant. Like black tea and coffee, it contains caffeine, so be aware that it will get you going in the morning and might keep you up at night. Yerba mate is known to relieve fatigue, ease depression, aid weight loss, and relieve pain. Ginger. Ginger has long been used as a remedy for an upset stomach. The tea made from ginger root can help with indigestion, but it can also help battle infections, stimulate circulation, and ease pain. The flavor of ginger tea is strong, so make sure you pair it with complementary smoothie flavors. Chamomile. The delicate flowers of the chamomile plant have long been used as a night time tea. Chamomile is relaxing and can help you sleep better and can help you get to sleep if you struggle with insomnia. It is also good for digestion and can ease minor aches and pains. Peppermint. Peppermint tea, made from the leaves of this herb, has a naturally sweet flavor that pairs well with fruity and chocolaty smoothie recipes. Peppermint tea is good for digestion and helps to relieve nausea and vomiting. Peppermint is also relaxing, and like chamomile can help you get sleepy at night. Dandelion. The root of this ubiquitous weed is actually very good for you. You can make a tea from dandelion root that helps improve digestion, relieve constipation and bloating, and cure an upset stomach. Dandelion root is also good at detoxifying the body by eliminating toxins from the liver and kidneys. Echinacea. Also known as purple coneflower, echinacea is an herb that is thought to boost the immune system. A tea made from echinacea is most beneficial during cold and flu season, as it may help to prevent sickness. Additionally, this herbal tea reduces inflammation, relieves minor aches associated with flus and colds, and contains antioxidants. Hibiscus. The hibiscus flower makes a vibrant, dark pink tea that tastes fruity, tart, and a little sweet. It is packed with vitamin C, is calming and can help fight insomnia, and contains antioxidants that battle free radicals in your body. It is also known to lower blood pressure by causing blood vessels to dilate and by improving circulation. Rosehip. Like hibiscus, tea made from rosehips is vibrantly pink, tart, and flavorful. Rosehips are the seed pods that you see at the base of roses and they are packed with vitamin C. A cup of rosehip tea can provide more vitamin C than many supplements and may be better absorbed in the body. This is a great tea for boosting the function of the immune system. St. John’s wort. This herb makes a tea that has long been used to relieve minor depression. While St. John’s is not a cure for depression, nor a substitute for medical care, it is effective at boosting the mood. In particular, this tea is a great smoothie addition when the gray skies and cold temperatures of winter are getting you down. This list is by no means exclusive, there are hundreds of herbal teas, these are just some of my favorites that have positively impacted my health and well-being. Herbs are my preferred form of medicine and consuming them in tea form is a great way to deliver their goodness into your body. Tea is a required ingredient in elixirs. Because of that elixirs are often viewed as medicinal drinks. If you’re not familiar with elixirs, please see my inaugural chocolate coconut elixir for more information and a great starting point. There’s nothing like an elixir on a cold winter morning. To peruse all my elixir recipes, click here. I also have a few green tea recipes. Click here to view those. All types of tea can act as great liquid base for your smoothie and elixir recipes. Water, juice, and milk are great, but why not try tea to boost the nutritional value of your daily drink? For everyday use, consider any of the true teas. For specific needs, try one or more of the herbal teas. Experiment with different teas to get a feel for their flavors and how they will work in your recipes. For many of the herbals, you can even mask the flavor if it doesn’t appeal to you. Just remember that if you want to try an herbal tea to target a specific health concern that you have, or if you are worried about any side effects or interactions, speak with your doctor first. I’d love to hear which teas you prefer and why – please tell in the comments below. 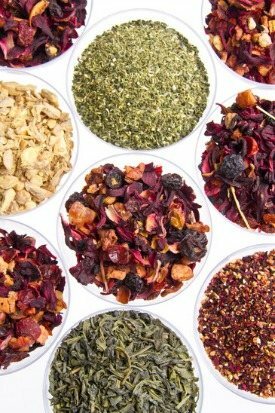 Your local health food store and tea joint will likely carry a variety of wonderful teas. For bulk herbs and the more exotic teas, I recommend Mountain Rose Herbs. Their prices and quality are hard to beat. When researching this article I was somewhat blown away myself by the numerous health benefits of various tea. Like smoothie ingredients, the challenge is fitting all of them into your daily routine. Large pots (roughly a gallon that will last a week) containing several herbs and/or mushrooms is the best strategy I’ve found thus far. So do you store your big batch of tea in the fridge and drink it cold? Yes, I store the tea in half gallon mason jars in my fridge and use it cold in smoothies and warm it up for elixirs.